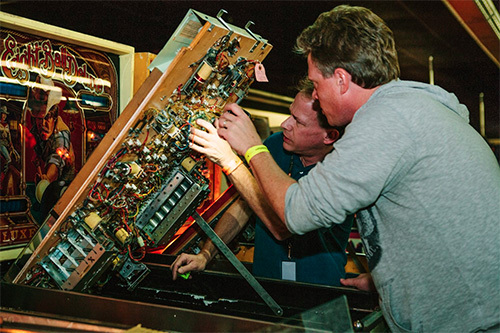 If you are a pinball or arcade cabinet owner, you know that these machines require constant maintenance and repair, especially the vintage games. Being southern California’s biggest arcade exposition, you won’t find a shortage of games to play, but unfortunately, to fix as well. If you are interested in helping out before, during, or after the Arcade Expo, please contact chuck@arcadeexpo.com. Knowledge in electronic repair and pinball maintenance is preferred, but if you’d like to help with assisting and organizing and cleaning, feel free to shoot us an email. We’ll be holding various tech days on weekends throughout the year. 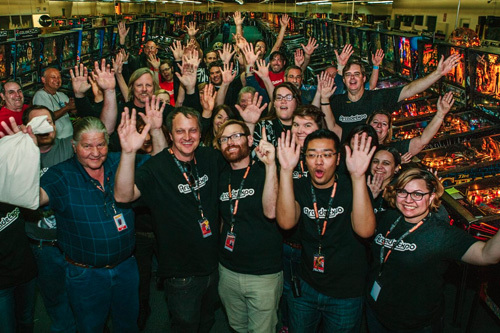 Arcade Expo appreciates everyone that has volunteered their time and effort to make our event successful. We’ve received plenty of positive feedback at how good and helpful our volunteers have been. Our volunteers get a t-shirt and badge as well as a day pass for the event. Those that volunteer for 8 hours or more will receive a weekend pass. If you’d like to help out with our next event, please email chuck@arcadeexpo.com. 1. Volunteers must be over 16 years of age. Those under 18 will need a signed parent/guardian release form. 2. Volunteers must attend a walkthrough of the event prior to their volunteer times. 3. Volunteers will be given a special badge and t-shirt for their volunteer times. These are non-transferable. Volunteers are requested to bring a change of cloth or something to wear over t-shirts while they are off-duty. 4. Volunteers are expected to have a courteous and friendly attitude throughout their time at the expo.